The following is a guest submission regarding a brand new website: www.communionantiphons.org. I had been working on the project that was to become Laudate Dominum Communion Antiphons for about two years when my wife and I decided to go live with the project. I didn’t realize that within a day I would receive an invitation from Jeff Ostrowski to write an entry for Corpus Christi Watershed discussing the project. The project stems from a pastoral need in my own church for liturgically worthy yet simple music for the Communion rite in the Ordinary Form, but it originally began as an attempt to reconcile two seemingly contradictory demands of Communion music that are found in the General Instruction of the Roman Missal (GIRM). That the GIRM puts the antiphons in the Graduale Romanum and the Missal in the first option for Communion music is well known, as is the tendency of most parishes to use the fourth option, “another suitable song” (GIRM 87). Whether the order chosen in the GIRM is hierarchical or arbitrary is irrelevant in this case; it is not my job to rehash The Liturgy Wars™. What is clear from both the GIRM and almost all previous musical legislation is that Gregorian Chant is to have pride of place in the liturgy. If we are to follow the letter of the GIRM, however, #87 needs to be tempered with #86: that the Communion chant’s “purpose is to express the communicants’ union in spirit by means of the unity of their voices, to show joy of heart, and to highlight more clearly the ‘communitarian’ nature of the procession to receive Communion.” The proper chants found in the Graduale Romanum are, for the most part, too difficult for the average lay person to sing, yet the GIRM expresses the desire for the congregation to sing at this part of the Mass. One way to reconcile these two desires is to simplify the Communion antiphons and their music, especially placing them in a responsorial style (which they are anyway). A short, simple response is good congregational music should the communicants want to sing. They require no hymnal or worship aid for reference while approaching the Blessed Sacrament, and still keep the Word of God in the mouths of the faithful. Responsorial antiphons were surely the way to go. 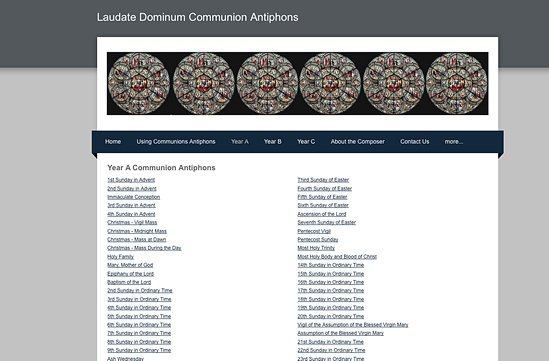 Laudate Dominum Communion Antiphons can be found for free at www.communionantiphons.org. I came up with the idea for composing them from several different sources. First, Christoph Tietze’s excellent paraphrases in his Introit Hymns gave me the motivation to explore other ways of using the propers of the Mass in English and in a simple setting. Shortly thereafter I discovered the renowned Chabanel Psalms right here at Corpus Christi Watershed. It was Jeff’s own blank staff at the bottom of one psalm saying “compose your own” that got me started. I tried it and said, “it certainly isn’t Jeff’s scholarly compositional method, but I can do this,” and off I went. My later involvement with the Church Music Association of America, both online and at their conference, turned me on to the value of publishing free music online. If I truly see the value in a musical project, why should I hamper distribution by charging money for it? Lastly, the grace of God has given me both the will to continue composing this large number of antiphons, as well as the serendipitous realization of the implications of using the matching modes for each antiphon. I originally started composing in each antiphon’s respective mode just to give me a musical framework for each antiphon. It wasn’t until a few months later that I realized the possibilities of using the English antiphons in conjunction with the Latin ones. I would like to thank Jeff Ostrowski and Corpus Christi Watershed for giving me the space to “plug” my work on their website. I also would like to thank my parish, Christ Prince of Peace in Ford City, PA for being tolerant of my attempts to branch out in this way. I finally would like to thank my wife and webmistress, Julie, for supporting me through this whole thing and for patiently hearing time and time again, “how do you think this sounds?” I hope these antiphons can be of use to you and your parish. After all, did I mention they’re free?